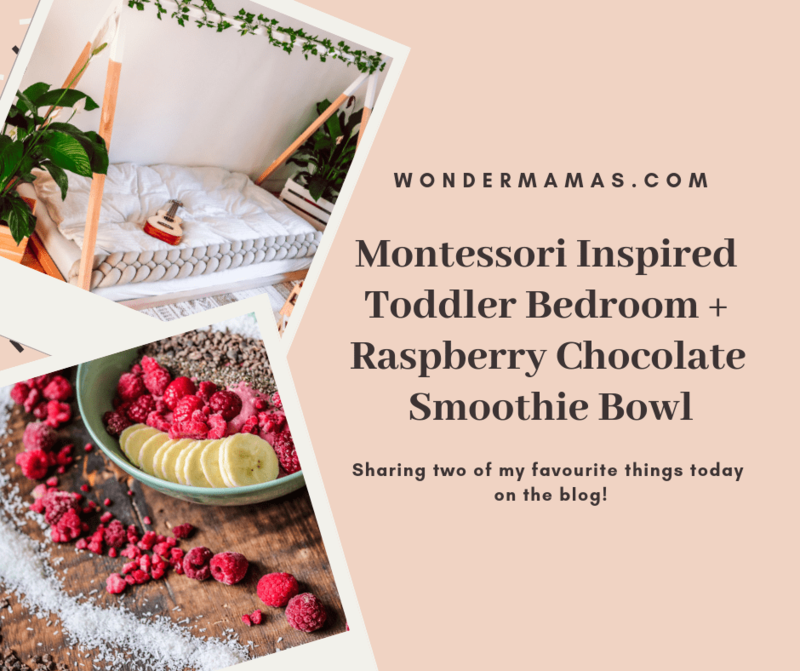 Before we get to our epic smoothie bowl recipe, let’s take a look at the boys Montessori inspired bedroom. We have been receiving so many messages on their shared room and I would be happy to show you around! When we moved into our new home, I had plans for every single room except for the boy’s bedroom…I just could not figure out how I wanted to go about decorating. For the first two months, this bedroom was simply two twin mattresses, the boys shared XL crib, a box of toys and cardboard boxes taped to the window to keep the light out. It was horrid haha. After we completed the living room and kitchen, I knew that this room had to go with the flow of the house; primarily white and green, minimalistic (of course), very natural, and above all, relaxing. I had this crazy idea; what if this room was ONLY for sleeping and relaxing? What if, as crazy as it sounds, I created the most relaxing zone for my twin boys? And it worked like a charm. An absolute charm. I fell in love with the idea of Montessori floor beds during my research to figure out which method I wanted the boys to be educated from; Montessori or Waldorf. We have not yet decided between homeschooling and traditional education or Montessori and Waldorf, but we have decided that we thoroughly love both, from the toys that are played with to the beds that the children sleep in. Traditionally, Montessori floor beds are used from a very young age (I read a range between 4 months and 1 year). We started our floor bed experience at 14 months and I think it was a wonderful transition for Leo and Alessandro. They had just started to use each other to catapult out of their shared crib, so this was much safer! We were able to find these beds locally at a little shop in Lana, Italy. The website for these beds is listed here; a company called ChildHome that is handmade in Belgium. You can absolutely make these beds at home if you wish, but we were in a bit of a time crunch (my mother was arriving in 2 days and I had to finish this room!). We found the braided linen bumpers on Etsy by a beautiful company named Zachee Design. This shop has the most stunning items; from swings to chairs, bumpers to hammocks. Cannot recommend this shop enough and the seller is one of the nicest women ever! For the blanket and sheets, we went ahead and used Martin’s blankets from when he was a teenager (his mother saves it all!) and just had them professionally cleaned. I purchased the duvet covers from Ikea: I chose this white lined fabric for the soft feel and cool touch. I also have a second set made of 100% linen that I absolutely adore and cherish. Linen only gets better with time and it is so fabulous for the environment! When we purchased the beds, we also threw in the matching closet that is Montessori inspired as well. It is low enough in height for the children to reach and also to add some free cloth boxes at the bottom for various shirts, pants, and socks. We had a bit of trouble in the beginning (about 2 days time) with the boys throwing the clothes all around, but with a bit of respectful parenting and proper blocking, they have not mishandled the clothing since! I snagged two wicker bedside tables from facebook marketplace for quite cheap and use these for onesies, pajamas and extra shirts. I keep their clothing amount as limited as possible for my own sanity as well as theirs. They really enjoy choosing their own clothes and we have lots of fun with it. Lastly, I used a wooden coat wall hanging to hang their backpacks and heavy jackets. They love to take the backpacks on and off and stuff them with various toys from the living room. I had a bit of a “relax” room in our previous home that had fake vines lining the ceiling. I carefully removed these and wrapped them around the top of the tipi frame. I also hung up a dream catcher that I snagged from Etsy while I lived in Hawaii, laid down a rug from Maison du Monde that was a housewarming gift from my family, and lastly hung up random decor that we had hung up in our old garden. We only had my Peace Lily Plants in here for the initial photos. They are safely back in the living room and bathroom where they receive much more sunlight. We have since swapped out for Jade Plants! My sons are extremely active; they run, jump, sing, scream, wrestle, cuddle, roll, dance and take bites out of every piece of fruit in the house and hide them in random places for me to find later. I created this space for them to wind down and take a breather. Like I said earlier, it worked like a charm. The boys just turned two and use this space for quiet play (especially when they are a bit upset over a toy being taken by the other or just tired from a long day) and reading. Reading happens primarily in this room and occurs right before naptime or bedtime. I adore the twin beds because I can fall asleep with them at any time of the day and all three of us are comfortable. Martin joins us a lot in family nap times and we each take one in our arms and cuddle them to sleep. When the boys are sleeping alone, they simply wake up and open the door and join us in our bed (or wherever we are at the moment) and I believe this sense of freedom has truly opened up a new line of trust and respect between us. I trust them to stay in their bed until they need me, and they trust me to be there for them with just a “Mama” call. Our Favorite Raspberry Chocolate Smoothie Bowl! This is our go-to Sunday Morning smoothie bowl! The mixture of cocoa powder, raspberry, and almond butter is just to die for! Enjoy, Mamas! Blend until Creamy. Add Toppings and Enjoy! i would like to have that bedroom for me!! it’s so beautiful and well decorated. what a peaceful spot. Thank you so much! This is their absolute favorite place for creativity 🙂 I wish my room looked like this too haha! What a lovely article! Thanks! The smoothie recepie sounds energising. Going to try it! I do hope you love it! It is so satisfying and yummy! Thank you so much! I knew that I needed to make it as relaxing as possible to calm down the nap time and sleep down chaos haha! Your deco is really amazing, you are gifted in this area I have to admit. By the way, love the baby body suit, super cute and bright and what a smart way to be included in this photo shooting of these pictures. Oh thank you so much! Those were gifted to us by their grandma at Christmas time and they adore them! I absolutely love your boy’s bedroom. The Montessori inspired room from the beds to the closets are so cute and creative! Your boys are going to love growing up in that room. I absolutely love those two beds, I want one for myself! 😉 And thank you for the recipe, already saved it on Pinterest as I have to try it! You are so sweet! Thank you so much for the kind words and support! Their bedroom is amazing, I absolutely adore the decor. I definitely need to give this smoothie bowl a try – it looks incredible. Montessori is a way of life for us. Such an amazing approach and your beds look amazing! That smoothie is calling my name! And the bedroom looks awesome too! I’d love to have this room for myself! It’s simple and beautiful. Wow – so many amazing ideas here! Thank you for sharing! I will absolutely share this with my other mama friends! Your little one is so dang cute! This looks like a yummy treat. Yum! raspberry chocolate smoothie looks wonderfully easy and tasty. And the bedroom looks really pretty. Smoothie bowls are my favorite! Such a healthy and delicious meal. I’ll have to try that recipe for sure. I just loved your nice ideas to groom the baby room decor. They all look helpful for parents with toddlers. This montessori inspired bedroom is so innovative. I must say unique. Kids will love being in such creative space. This sounds so amazing! I cannot wait to try it. Boy does this look good ! OH MY GOODNESS!!! Can I please have that bedroom for me?! I absolutely love every single thing you did in there. Everything is so minimalistic, clean and super stunning! You did an awesome job! What a cozy bedroom! The smoothie bowl looks delish! Wow! How whimsical! I love the space you created for your boys. Also, you had me at raspberry chocolate smoothie. I saw the beautiful bedroom, but immediately scrolled down to see what the smoothi was about! Lol 🙂 yum! I must say this room is too nice for these boys, lol. I would totally sleep in there myself. And I love the recipe easy and fun! Good job on what you did on your kids bedroom. It looks really lovely. I’m drooling over your raspberry chocolate smoothie bowl.